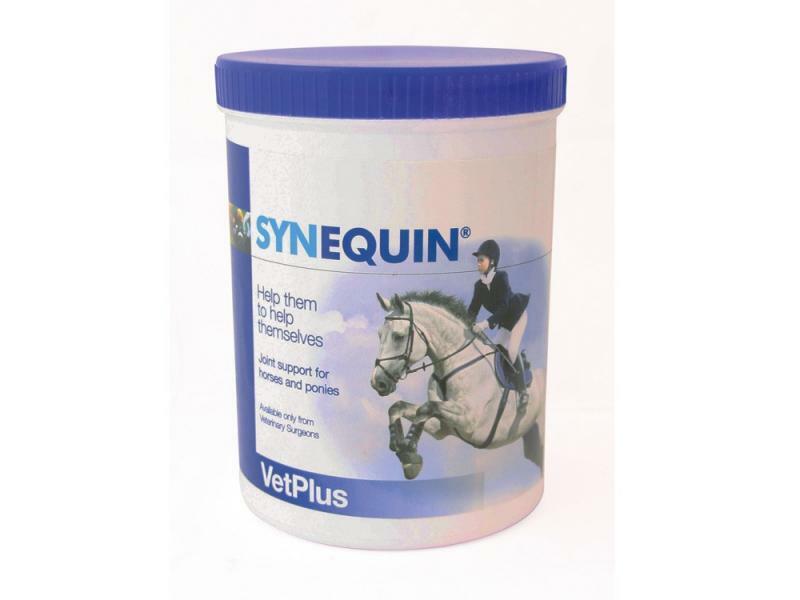 Synequin is a nutritional supplement used in horses and ponies to support healthy joints. Containing glucosamine, chondroitin sulphate and various antioxidants, Synequin is designed to maintain healthy cartilage and support your horse's joint functions. 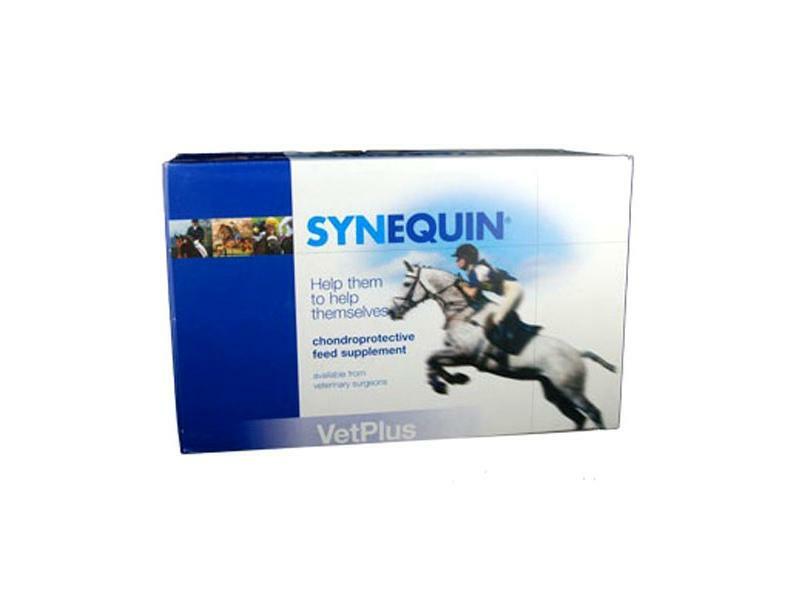 Synequin is made by VetPlus who also manufacture Synoquin - the highly regarded and widely acclaimed joint health supplement for dogs and cats. Please follow the feeding instructions carefully and do not lower suggested levels unless advised by your veterinary surgeon. To obtain optimum results, it is important to complete the intial feeding programme in full. As all horses are different and their conditions vary widely it is important to monitor their movement and comfort level daily to determine optimum feeding levels. Experience has shown that, in general, intake can be reduced gradually to one scoop every other day. However, your veterinary surgeon will advise you based on the breed, age, weight and condition of your horse. D-Glucosamine HCI, N-Acetyl, D-Glucosamine, Chrondroitin Sulphate, Dextrose Monohydrate. Vitamin C (E300 Ascorbic acid) 50000mg/kg, Zinc (Zinc Sulphate Monohydrate) 12250mg/kg. Below are some recent questions we've received regarding Synequin Equine for Horses, including answers from our team. For horses over 500kg the loading dose is 3 scoops a day for 35 days, followed by a transition period of 1.5 scoops from days 36-60 then reducing gradually to a maintenance dose of 1 scoop every other day. However you should monitor your horse- it may be that 1 scoop every day is required to maintain mobility and comfort depending on their condition. What is the maximum dose I can feed my 26 yr old TB on a daily basis. He is on one and a half sachets per day but I feel that he was going a lot better when giving him the loading dose of 3 sachets a day. Thanks in advance for your advice. Regards. It is safe to continue with the loading dose indefinitely. Usually the dose is reduced because it seems to work pretty much just as well after a while and is of course cheaper. It is safe to continue on the full dose if that is beneficial. These products should be OK mixed together in one meal. If he is not keen on it that way, you might have to split them up a bit. See what works with him. It is safe to give with both turmeric and bute. In fact these products are quite often combined and it is thought that they can work synergistically together, improving overall results. Will this benefit my pony with arthritis in his coffin joint ? My vet had mentioned this product to me I was just wondering if it would be beneficial for my cob who has arthritis in his coffin joint ? He's been badly lame now for about 2-3 months and recently had a nerve block and has been put on bute to see how he gets on, would this help him at all ? And would he have to come off the bute to have this ? This product is safe to give alongside other treatments and is often combined with "Bute". I cannot tell you if it will work for your horse as results seem to vary from one to another, but many horses do improve. Sometimes you need to give it for a few weeks before you see a full response, so do not give up after a few days if it does not work immediately. If it does work then ideally you give it for life, though you might not need to. Hi - I started using Synequin in April. I completed the loading dose as stated but missed out the transition dosage and went straight onto the maintenance dosage for my 16 2 hh TB. Will it make any difference to the outcome or should I revert to the transition dosage? This is unlikely to make any significant difference so I would tend to continue with the maintenance dose. However if your horse has shown particularly severe symptoms of stiffness/discomfort then it would be advised to increase to the transition dose to try and get the maximum benefit possible. Doing this is unlikely to affect the long term outcome at all, but it might give a slightly quicker response. My 19 yr old 17hh Clydesdale X has been on Superflex. I've ordered Synequin - would you still recommend a triple dose for 35 days to start with? It should be fine to go straight onto the maintenance dose from the start. If you were to go onto a loading dose initially it would not cause any trouble, but I would not expect you to see any extra benefit from it. Once into maintenance mode, can you feed on 5g every day or does it have to be 10g every other day? It is perfectly OK to give 5g daily, instead of 10g every other day. i am interested in the synequin for my two horses, both currently on glucosamine but think they need something stronger. do you think this would be the most effective product and how long would a 1kg tub last for them? Synequin has generally been regarded as the gold standard in glucosamine supplementation and is a very good choice, though different horses can seem to respond to different products. At a maintenance dose rate, a 1kg tub contains 100 days worth of medication for 1 horse. Ideally a triple dose is given for the first 35 days for a horse which has not had supplements before. Hi can I give my horse synequin ? He is a ex-racer with ulcers, and could it cause fizzy ness ? Synequin should be safe to use for your horse. It should not make him "fizzy" and is not associated with ulcers.